The capital has 436 buildings over 20 storeys in the pipeline – and, of those submitted over the past year, only three have been rejected, reports The Guardian. London’s skyline is changing dramatically, with almost double the number of tall buildings in the pipeline compared to two years ago, and only three planning applications rejected over the past 12 months, according to a report by New London Architecture and GLHearn. Since this time last year a total of 119 new buildings with at least 20 storeys have entered the planning process. These take the total number in the pipeline to 436 – 89 are under construction, 233 have approval but work is yet to start, and 114 are at the planning or pre-application stage. This is almost double the 230 in the pipeline two years ago. The report also found that – of the 94 tall buildings submitted for planning approval over the past year – 43 were approved and only three refused. Most of the 43 form part of the Greenwich Peninsula scheme, while those rejected were Hounslow House in west London, the “central phase 4 site” in Woolwich, and Gagarin Tower in Southwark. Renzo Piano’s controversial “Paddington Pole” scheme was withdrawn. The rest still await a decision. In the City, 1 Undershaft will match the Shard for height and become the tallest in the square mile at 73 floors high. 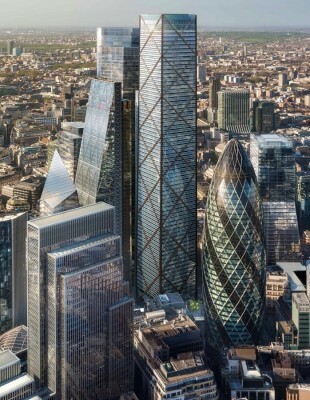 Reworked plans for 22 Bishopsgate were approved. Elsewhere in London, Tower Hamlets is home to 93 proposed tall buildings – including City Pride, the capital’s tallest residential building at 75 floors – Greenwich has 67, Barnet has 23 and Croydon has 18. A small tower building developed by TIAA Henderson Real Estate, with more than 277,000 sqft of offices across 24 floors. This 38-storey tower design gained approval in 2013.
construction work recommenced on site in January 2011.